Registered nurses with a Bachelor of Science in Nursing degree (BSN) earn higher pay and have more opportunities — it’s what employers want in their nursing staff. In a 2017 survey by Payscale.com BSNs with 1-4 years of experience earned an average of $69,697, while RNs with an Associates Degree and the same 1-4 years of experience earned $61,360. Plus, a 2016 study from Nurse Journal found that of 187,000 nursing jobs posted over a 90-day period, RNs with associates degrees were eligible for 51% of them, while BSNs were eligible for 88% of those jobs. With our accelerated program at Eagle Gate College, you can earn your degree in as little as 36 months. A little more work now really pays off in the long run. Our Bachelor of Science in Nursing opens the doors to work as a registered nurse in these healthcare settings, among others: complex and critical care, acute care, long-term care, community health nursing, school nursing, and home health. This degree will prepare you to sit for the NCLEX-RN licensure examination. Where will you take it from there? The sky’s the limit. The Bachelor of Science in Nursing program at Eagle Gate is offered in a hybrid format. The majority of courses are offered online, so it’s perfect for working adults, full-time parents, and others who can’t attend class every day. The Bachelor of Science in Nursing degree is accredited by the CCNE. You can relax knowing your BS in Nursing degree from Eagle Gate College will pay dividends wherever it takes you. 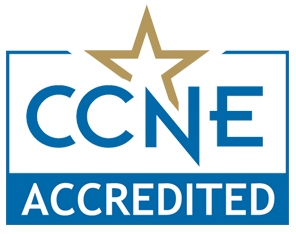 Our BS in Nursing degree is fully accredited by the Commission of Collegiate Nursing Education (CCNE). Learn more at the CCNE website. The Bachelor of Science in Nursing degree at Eagle Gate College is accredited by the Commission on Collegiate Nursing Education, 655 K Street NW, Washington, DC 20001, (202) 887-6791. More at www.ccneaccreditation.org.